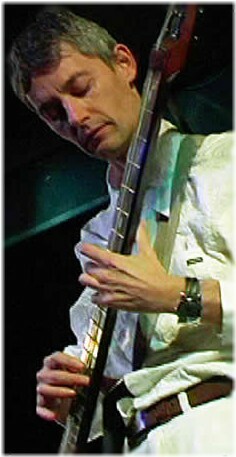 French Stick player Andre Pelat has been very active in recent years, performing and teaching in Europe. Last November, he made an impressive debut in the U.S. when he came to teach and perform at the World Stick Seminar in San Jose, California. Andre began playing Stick after seeing Emmett perform on French TV in 1980. He took to the instrument and tapping method immediately, performing in the jazz clubs of Sète, France. In 1988, Andre was asked to take part in the composition and arrangement of the score for the silent film "Tramp Tramp Tramp." During the 90s, he performed all over France as a soloist as well as in various ensembles playing jazz, classical and Latin rock. Recently, he has performed with The Stick Trio composed of Guillermo Cides, Jim Lampi and Ron Baggerman in Europe and the U.S. and established an excellent reputation as a Stick instructor. You can find more about Andre on the web at www.andrepelat.com.